Note Dittmar is wearing the Finnish Order of the Cross of Liberty, 1st Class with Swords around his neck. 6 March 1909: Entered the Army as a Fahnenjunker in Magdeburgisches Pionier-Bataillon Nr.4. 30 October 1909-22 July 1910: Detached to the Engen War School. 1 October 1912-5 August 1914: Detached to the Military Technical Academy. 6 August 1914: Adjutant of Pioneer Replacement Battalion 4. 22 September 1914: Platoon Leader in the 1st Field Company of Pioneer Battalion 4. 4 February 1915: Adjutant of Pioneer Battalion 4. 8 January 1916: Company Leader in Pioneer Battalion 4. 9 December 1917: Deputy Leader of the I. Battalion of 5. Hannoversches Infanterie-Regiment Nr. 165. 9 January 1918: Again, a Company Chief in Pioneer Battalion 4. 22 June 1918: Deputy Leader of the III. Battalion of Infantry Regiment 165. 25 August 1918: Commander of the III. Battalion of Infantry Regiment 165. 22 February 1919: Company Leader in Volunteer Battalion “Quedlinburg” of Infantry Regiment 165. 29 July 1919: Transferred to Reichswehr Schützen [Rifle]-Regiment 8. 26 August 1919: Detached to the Quedlinburg Garrison Command. 4 February 1920: Consultant and Interpreter Officer with the Army Peace Commission in Dresden. 1 October 1920: Company Chief in Pioneer Battalion 4. 1 October 1924: Pioneer Officer on the staff of the Commandant of Fortifications at the River Ems estuary, Borkum. 1 October 1927: Instructor at the Infantry School. 15 September 1931: Transferred to the Reich War Ministry/In 5. 1 October 1931: Transferred to the Pioneer Inspectorate in the Reich War Ministry/In 5. 1 January 1934: Commander of Pioneer Battalion 1. 15 October 1935: Commander of Pioneer I. 6 April 1937: Commander of Pioneer School I. 26 August 1939: Commander of Pioneer School II. 1 October 1939: Transferred to the staff of the General of Pioneers/Army High Command. 11 October 1941: Army High Command Leader Reserve. 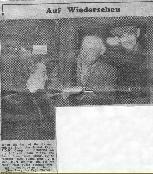 23 April 1945-17 May 1948: Prisoner of war in U.S. and, later, British captivity. 12th May 1948 transferred to Camp 186 for repatriation. 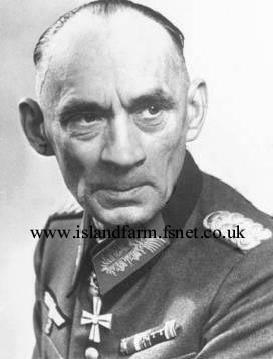 German Cross in Gold: 19 December 1941, Generalmajor, Commander of the 169th Infantry Division. Finnish Order of the Cross of Liberty, 1st Class with Swords: 26 October 1941. Click here to see photos of Generalleutnant Kurt Dittmar in the company of fellow prisoners of war at Island Farm.